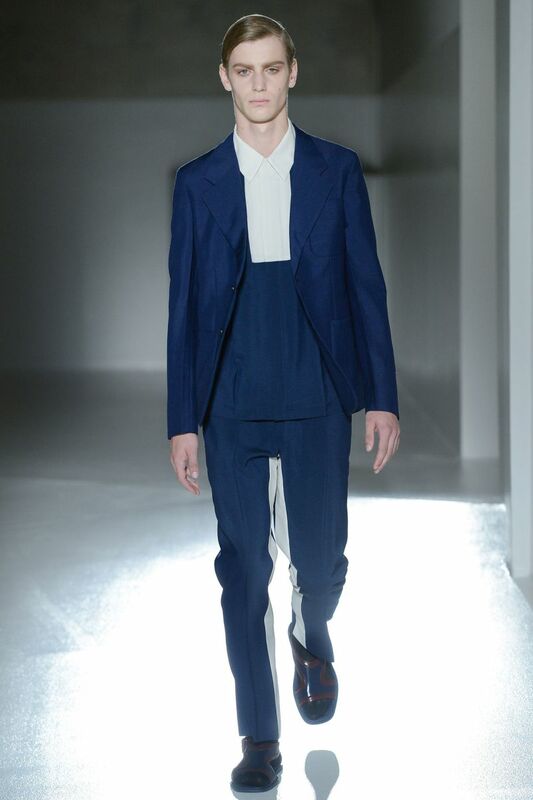 Much like womenswear, the spring trend for men’s fashion is minimalism. Clean lines and toned down shades of neutrals, navy and olive were rampant at the spring and summer shows. Simple silhouettes were spotted on the runways of Raf Simons and Prada — basic suited ensembles cut with classic tailoring. Another huge trend that is still going strong for both womenswear and menswear is the athletic look. Alexander Wang embraced the sporty side of minimalism by creating a spring collection of baseball caps and hoodies. Kenzo presented their most popular item of apparel — their tiger sweatshirt. 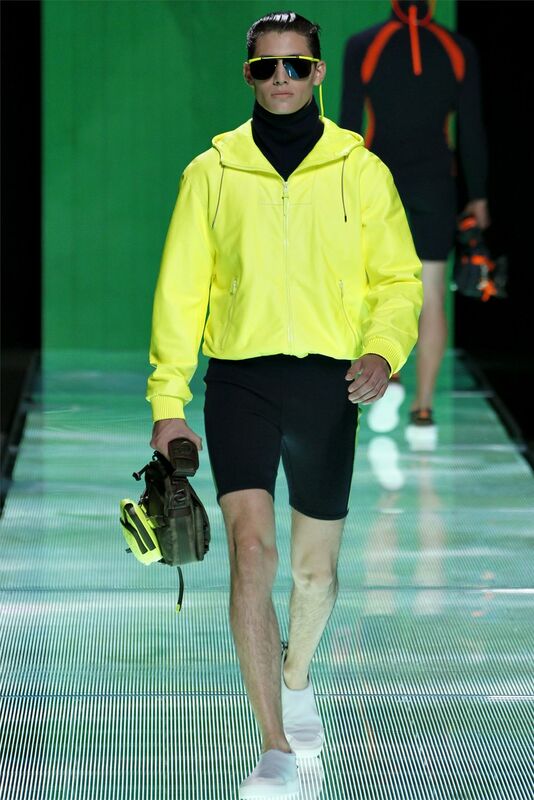 Over at Louis Vuitton, outfits were inspired by water sports. Wetsuits and hooded anoraks that would fit right in on a boat were the standouts of their show. Baseball bomber jackets in bold metallic colours were showcased heavily on the runway at Burberry. But for a more daytime-friendly look, try a baseball bomber jacket in an earth-toned leather. It’ll go well with most outfits since it can be dressed up over a shirt and tie or casually worn over a graphic tee. 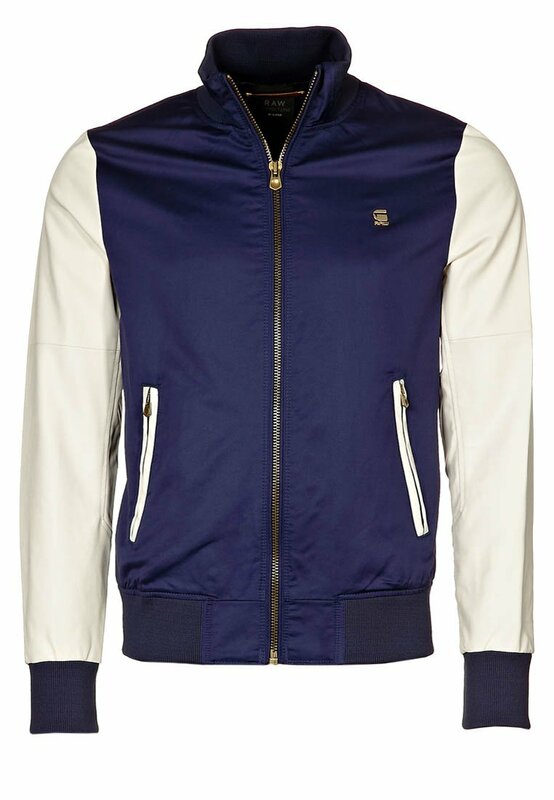 Add some street style with a baseball bomber jacket such as this one from G-Star. An item that should already be in every man’s wardrobe is the versatile polo. An essential for the warmer seasons, polos can work with a variety of styles. Pair one with shorts or khakis for a preppy look or go casual chic with a blazer over a polo and trousers. Both classic and on trend because of the polo’s sport association, the key is fit. Look for one that will provide a streamlined silhouette and avoid the oversized, boxy type that was all the rage in the 90s. 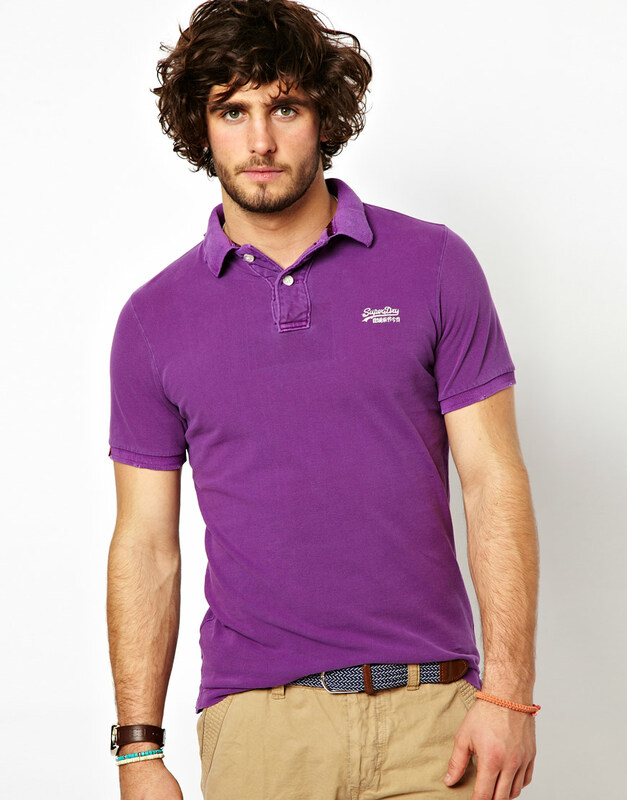 Stay stylishly cool in a coloured polo by Superdry. Fitting in with the minimalist trend is the sockless look. Appearing to go sockless in shoes from sneakers to loafers has become big over the years. Seen at the spring shows of Gucci and Louis Vuitton, to name a few, the look has been featured in a number of fashion editorials in men’s magazines. To prevent odours from sweat, try no-show loafer socks and look for ones made of antimicrobial material. 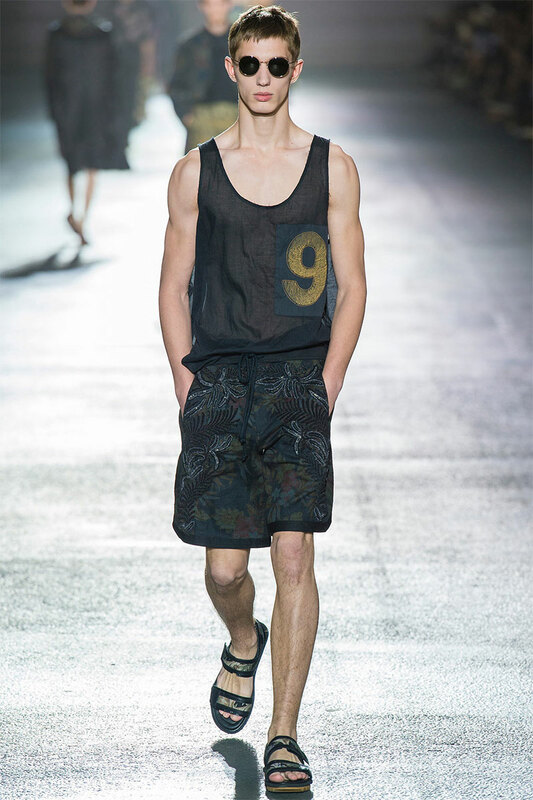 Wear two trends at once by going sockless and sporty as seen at Louis Vuitton. More often than not, guys tend to play it safe in neutral coloured ensembles. 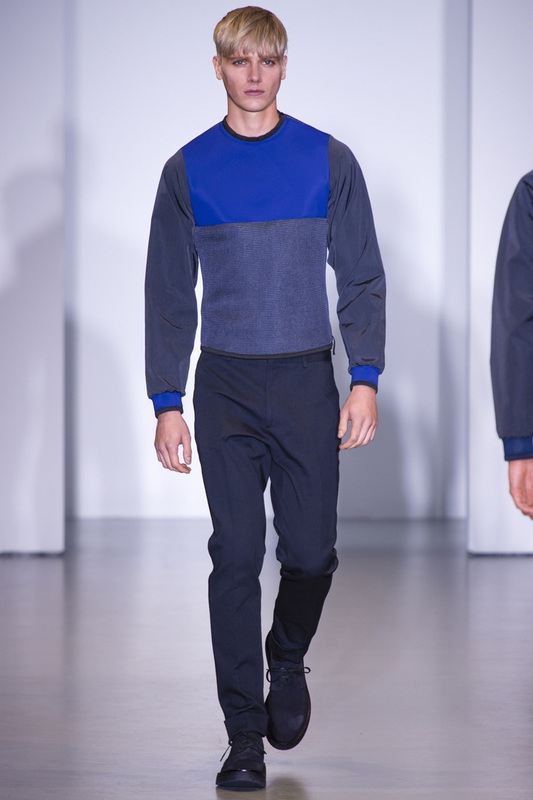 Even the menswear runways were awash with shades of grey, navy and olive. But the warmer months are all about colour. Whether you’re clothes shopping for yourself or a boyfriend, avoid the basic black, white or grey version and go for the more vivid colours. Play around with hues of pastel or bold blocks of complementary shades. For an easy transition from a monotonous wardrobe, add a splash of colour to a neutral suit with a bright shirt. Don’t be afraid to incorporate prints into your wardrobe as well. Florals may seem intimidating at first, so start with smaller doses such as a floral tie. Trendy prints that are easier to mix into menswear are camouflage and stripes. Dries Van Noten revived the camouflage print again for this season, while stripes were seen at Dolce & Gabbana and Jean Paul Gaultier. For something a little more unexpected, pair printed bottoms with a solid shirt. Neutral stripes usually look sharp when combined with a solid, bold colour. Try wearing a striped tee with coloured denim for a smart, casual look. 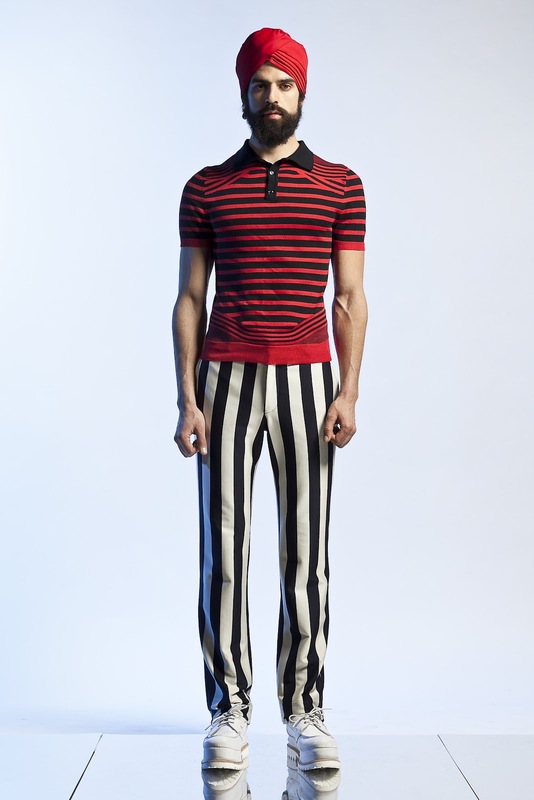 Bold stripes at Jean Paul Gaultier’s spring presentation. Accessories are always an easy way to add some presence and update your wardrobe. Bags, ties, sunglasses, belts, hats, jewelry and watches are all great for showing off your personality and sense of style. Fashion trends are about experimentation so have fun with it whether you’re out shopping or choosing an outfit for the day. It can help set the tone for your confidence, attitude, and how others react around you. Fall was all about opulence and lavish textures with its embellished details, baroque styles and layering trends involving leather, fur, velvet and brocade. But for spring, the fashion industry went down a more minimalistic route. The biggest trend this season is the simple, high contrast black and white. Usually designers stray from black and opt for soft pastels in their spring and summer collections, but the graphic duo of black and white made a huge impact at most of the major shows. From Calvin Klein in New York, to Céline in Paris, to Milan’s Moschino, black and white ensembles rocked the runways in a variety of styles. A combination that’s super wearable for everyone and suitable for day and night, black and white is now both timeless and on trend. For an updated way to wear black and white, try incorporating pieces with bold stripes or monochromatic checks. 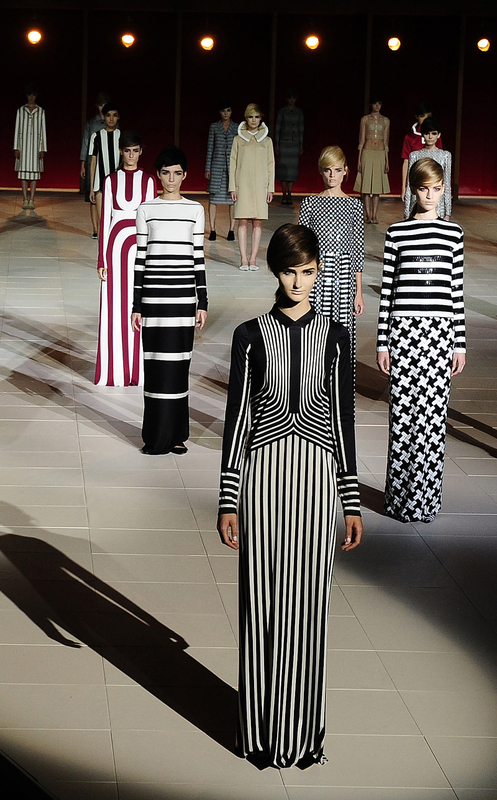 Marc Jacobs sent a number of his models down the runway with black and white striped and checked outfits. Stripes are another big trend for spring, so you don’t necessarily have to incorporate black and white versions of striped clothing. Michael Kors featured rugby stripes of red, navy and green in his collection while Christian Dior used bold lines of pink and black. Easy to incorporate into any style, try a navy striped tee with shorts for a nautical look or black and white striped denim for a Balmain-inspired rocker vibe. Another trend this is season is the boudoir look. This means adapting pieces we normally would associate with lingerie into transparent items for our everyday wear. Look for sheer and light fabrics such as organza, silk chiffon or mousseline. In terms of style, the transparent look comes through in lace details, mesh panels, cutouts and high slits. On the runways, Alexander Wang showed deconstructed dresses with sheer panels and cutouts. Crop tops and slip dresses were spotted at Rochas, and Akris presented a multitude of transparent ensembles. For a wearable and fun night look, pair a cropped tank with a high-waisted skirt or pant. Or swap a blouse with a bustier to wear under a blazer. The key is to keep things subtle — show just a hint of skin that isn’t normally revealed with the usual jeans and tee. Cutouts featured at Alexander Wang’s spring show. The luxe sport trend is also big for spring. Bomber jackets were seen at Stella McCartney and sporty dresses were included in a lot of the collections. A great way to wear this trend for the warmer months is with scuba dresses. Characterized by a higher neckline, exposed zipper, fitted sleeveless bodice, and usually with black panelling down the sides, the skirt of a scuba dress can either be a-line or more body conscious. Dress them up with heels or pair them with canvas sneakers for a more casual look. Look sporty with a scuba dress like this one at Victoria Beckham. Still going strong from autumn are the leather and pantsuit trends. Perfect for the transition into spring, opt for suppler, lightweight leather in unexpected colours and styles such as a flirty oxblood leather skirt. 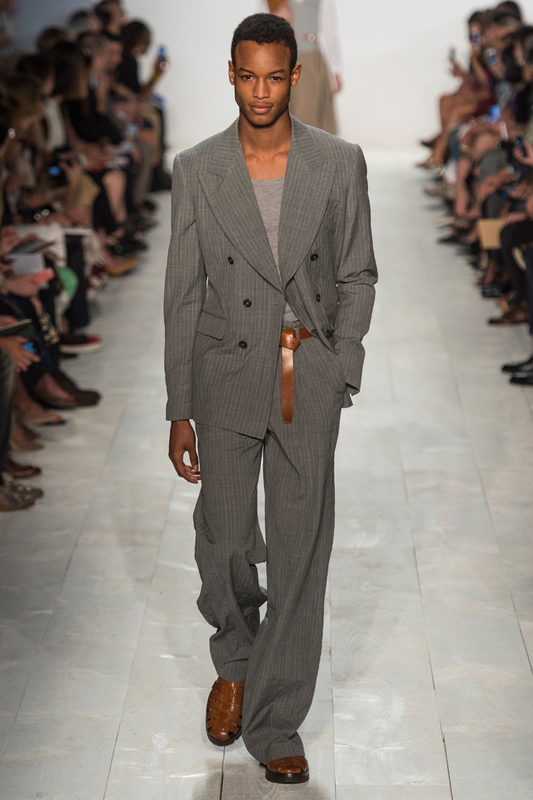 With the power suit, both masculine and feminine shapes were spotted on the runways. For a cool and versatile twist, pair a suit blazer with formal shorts or cropped pants, as seen at Tory Burch and Helmut Lang. For smaller details, ruffles, exotic patchworks and Japanese silhouettes are also in. With frills prominent at Gucci, Givenchy and Chloé, the ruffle is an updated variation on the peplum trend from previous seasons. If you want to add a big splash of patterns and colour into an outfit, try a patchwork top or dress such as those seen at Rodarte or Proenza Schouler. Similar to a collage, the modern patchwork combines different textiles in complementary colours and patterns. And to emulate the Japanese-inspired looks at Etro and Prada, look for kimono-style wrap tops or dresses with wide, structured belts. 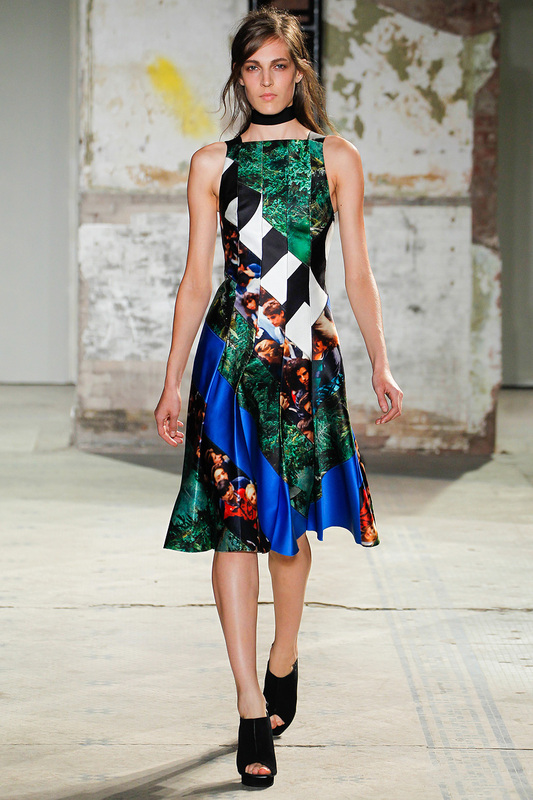 The patchwork trend at Proenza Schouler. There’s a trend for every look this season. And with black and white pieces already in your wardrobe, you’re set to start out spring with style! Whether you’re the type to pile on jewelry or adhere to a minimalist approach, accessories are a simple and cheap way to spruce up your wardrobe as we transition into the next season. 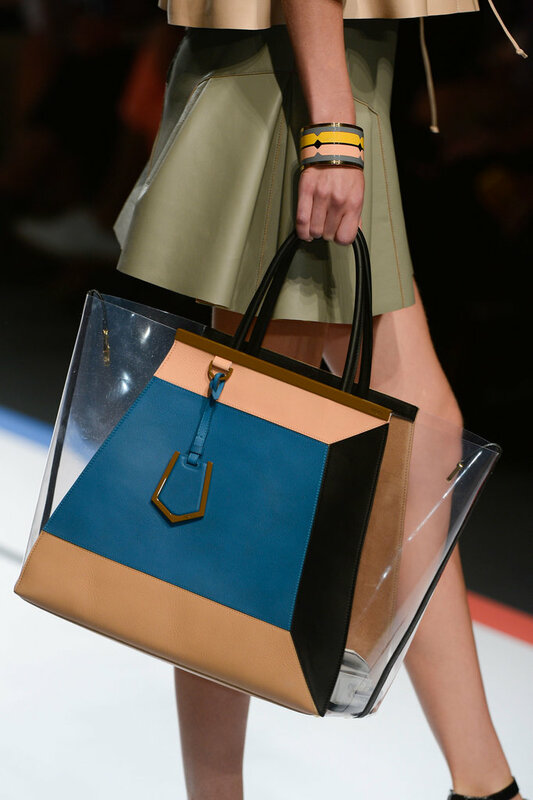 And as spotted on the runways for spring, there are plenty of accessory trends to fit every style. The look was ladylike and demure on the pastel-shaded runway at Louis Vuitton. Dreamy lace outfits were accentuated with candy-coloured handbags and pointy mules in combinations of metallics and light hues. Easy to wear, a pale purse or oversized envelope clutch will brighten up any outfit without stealing too much focus from the rest of your ensemble. As part of the 1920s throwback to the Great Gatsby trend emerging this year, art deco-inspired accessories are cropping up for spring. 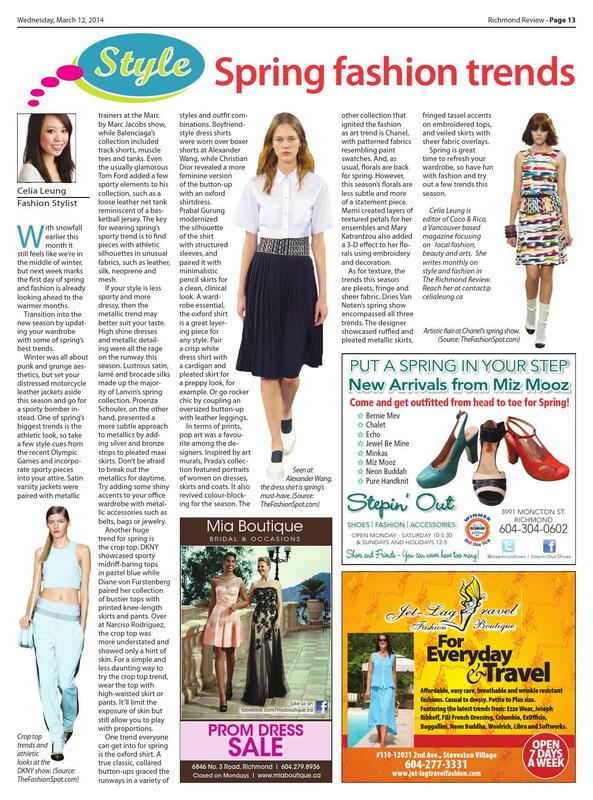 Seen on such runways as Milly and Alexander Wang, art deco fashions may be easier to incorporate through jewelry. Look for embellished pieces that use geometric designs and patterns in bold colours. 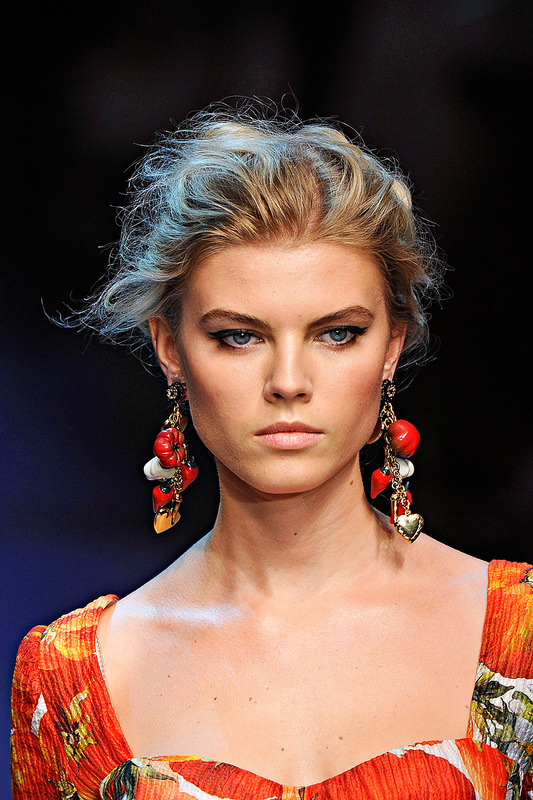 A bonus if they’re oversized art deco earrings — you’ll be getting two trends in one since ear accessories are in vogue for spring and have become the statement jewelry for the Chanel and Dolce & Gabbana shows. For those wanting to take on a bolder style as the weather starts to warm up, look for accessories inspired by tribal prints and materials. Burberry sent their trench coat-clad models down the catwalk accessorized in tribal belts, heels, bags and hats. Over at Michael Kors, the focus was all on safaris — his collection of earthy sandals strapped up the calf looked fit for an expedition in the wild. The key to a good tribal-inspired piece is multiple textures and vibrant patterns. Look for accessories that incorporate wood or beads for that extra flair. 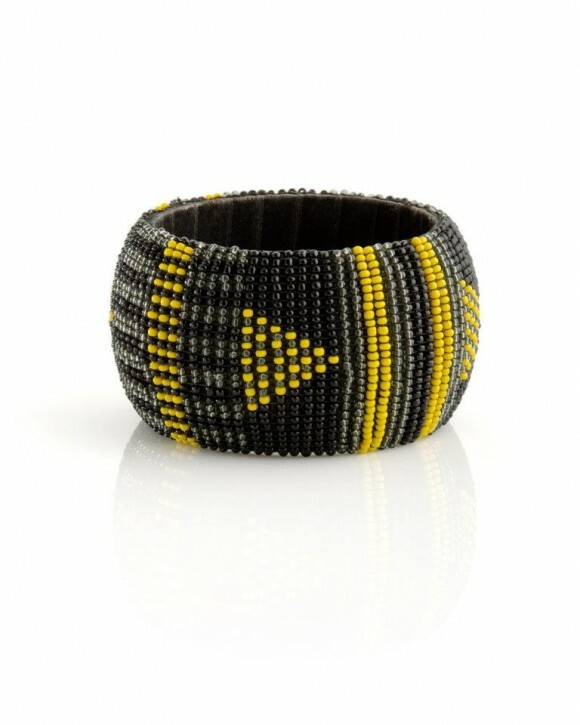 Show some arm candy with this beaded tribal bracelet from Jewelmint. Tribal patterns translate well for nails too. Whether done by a professional or painted at home using a nail brush, tribal designs will be sure to attract attention to your fingertips. As for other nail trends, a lot of designers opted for neutrals on the runway such as nudes, French manicures and pale pinks. Retro neon shades are also hot for polishes: classic reds in the style of Mad Men, bright corals and Pantone’s colour of the year, Tangerine Tango. On your Marc, get set, go! 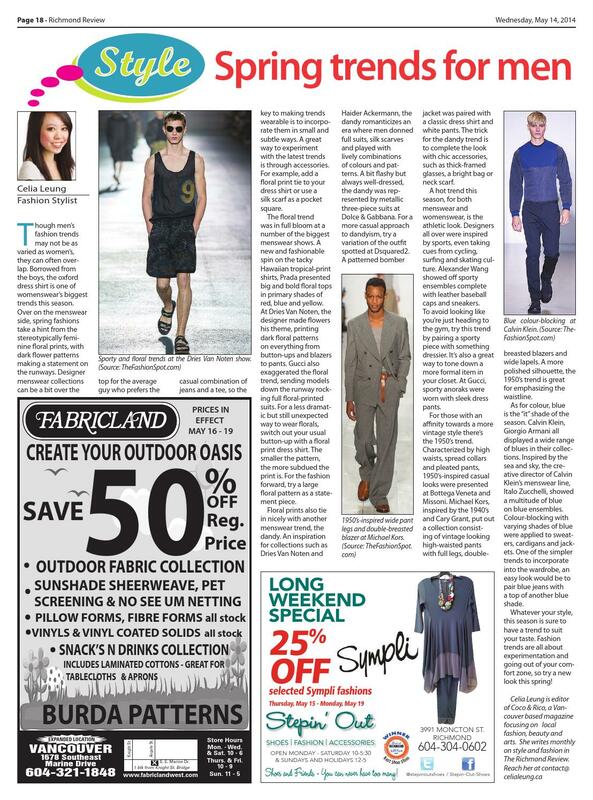 Another big theme for designers this spring is athleticism. Sporty ensembles graced the runway at Alexander Wang and Marc Jacobs, and along with that came the return of backpacks as accessories. 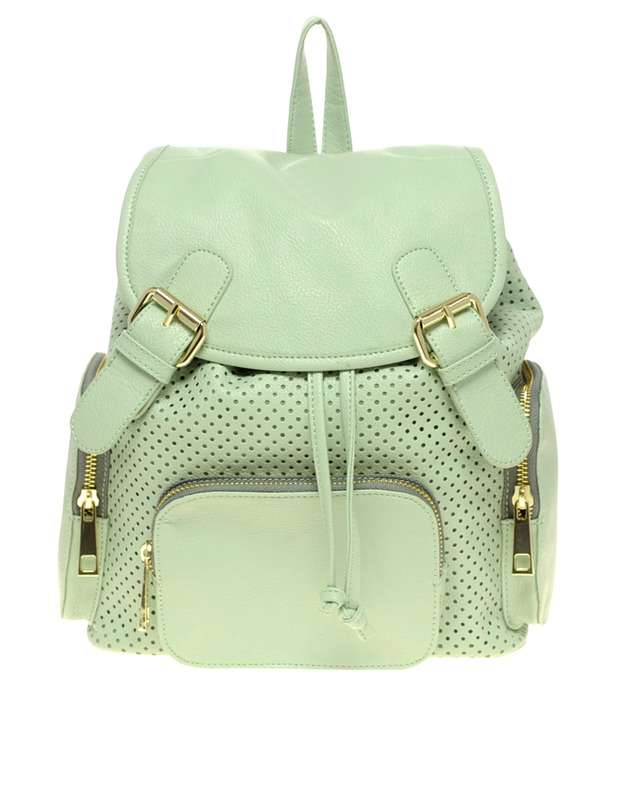 This isn’t a revival of the mini-backpack trend that was all the rage 15 years ago though (I still have a patent leather one in pristine condition stored away in my closet). 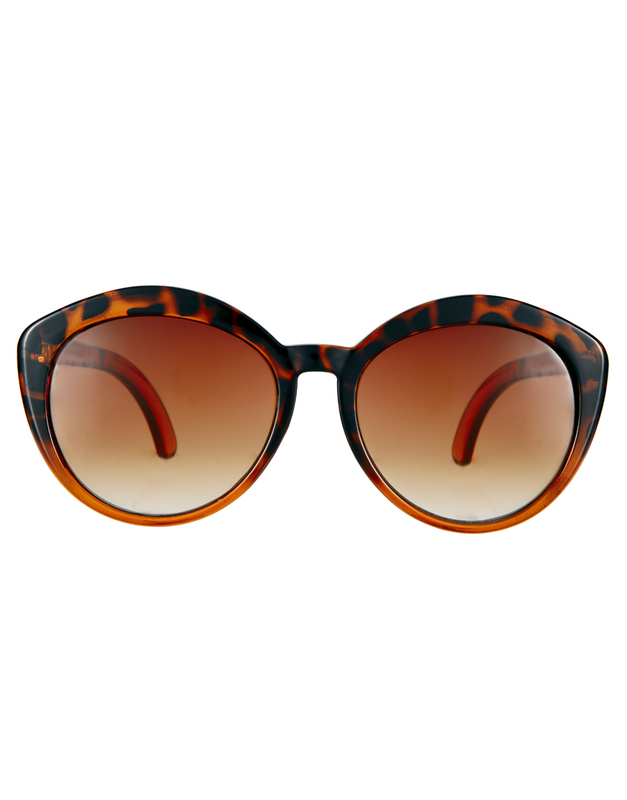 The ones popping into stores for spring are larger and are fashioned in an assortment of colours, shapes and exotic skins. But for those who feel their knapsack days are over, another simple and fun way to sport the athletic trend is through brightly banded, rubber wristwatches. 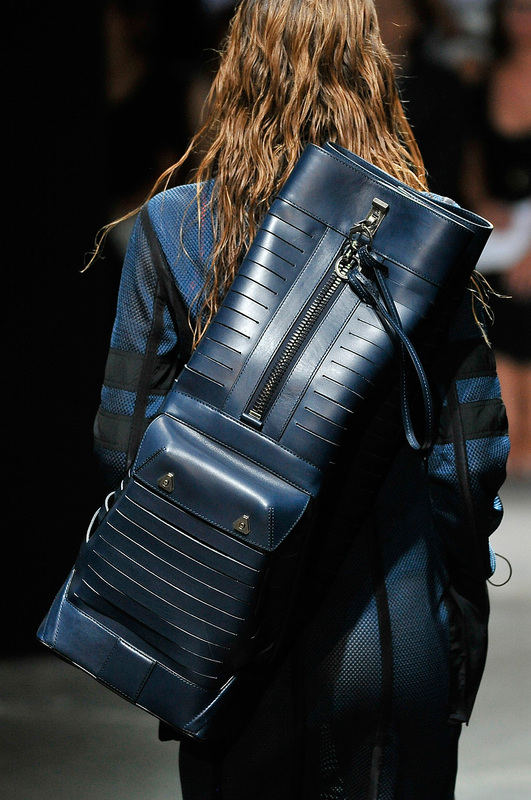 Not your average schoolbag -- sporty backpacks were featured at Alexander Wang. If you’re looking to buy an ‘it’ shoe, go for heels with a platform. We’re not talking about platform boots typical of the Spice Girls, but something more understated. Look for vivid sandals or pumps with a slight platform. Comfort won’t be compromised too much in higher heels because of the heftier sole. You’ll be standing tall and trendy with these platform pumps from Zara. Accessories are a good starting point for experimentation with a trend or style not typically your norm. Don’t be afraid to branch out but try not to incorporate too many trends into one outfit. It’s also not necessary to dress in one trend from head-to-toe. Sometimes it’s more eye-catching if you’re wearing a basic ensemble accessorized with one or two statement pieces. Most important of all is to have fun with it — a good accessory can take your outfit from drab to fab.